In this article we’re going to be discussing what the top 19 thunderbolt audio interfaces are that are available in 2019. However, before we dive right into what the best products are, let’s briefly discuss what the benefits are, to using an audio interface with Thunderbolt connectivity. What are the benefits of using an audio interface with Thunderbolt connectivity? How to choose the right Thunderbolt-compatible audio interface? Firstly, Thunderbolt is mainly used within audio interfaces for Mac computers, however, there are an increasing number of PC laptops which are appearing on the market which are compatible. Thunderbolt (particularly Thunderbolt 3) connectivity provides a few interesting benefits, which include, allowing for users to connect up to 6 devices to one port without experiencing a loss in transfer speeds. 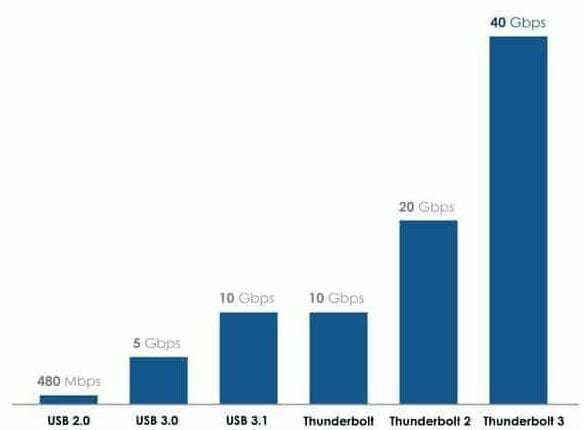 Additionally, the Thunderbolt connection type is, in general, significantly faster than both USB 2.0, 3.0 and 3.1 (as highlighted in the graph shown below), so you can be sure that latency issues are less of an issue with these interfaces. Well, firstly you have to take into consideration the basic requirements that you demand from an audio interface, and those basic requirements will usually be the cost, number of inputs, number of outputs and customer feedback/reviews. With that being said, we’ve displayed all of the above, directly below a bullet-pointed list. The list itself is ordered by the number of inputs/outputs that an audio interface has, with the secondary ordering being by price. Rest assured that we’ve done research into all of the following interfaces, and they have all been chosen based on their previous customer feedback, brand and value for money. With all that being said, let’s discuss the top 19 Thunderbolt-compatible audio interfaces. The Resident Audio T2 interface is the most affordable unit featured on the list. However, don’t let that give you any preconceptions to the quality of the interface, in particular, the sound quality, with it being able to operate at 24-bit/96kHz. For such a small and affordable Thunderbolt-compatible audio interface, it comes with 2 combination XLR/TRS inputs, both of which have separate phantom power switches, making it ideal in cases where you only need it on the single channel. Additionally, the unit has a MIDI input and output, so this is ideal for someone who potentially has a keyboard/synth that they want to additionally connect. Finally, the unit has 2 dual-balanced line outputs which are the left and right feeds, and 1 headphone output. The T2 also has a Smart Monitoring feature, which allows you to easily switch between stereo and mono monitoring. Overall, we think that this interface is great for an artist who wants a lightweight & compact audio interface, providing combination XLR/TRS inputs. Not only this, it’s fully bus-powered, which means no AC cords or batteries are required for operation, meaning that you can easily integrate it into your live performance or practices, without any fuss. The Zoom TAC-2R is almost identical in size and features to the previously discussed Resident Audio T2, but there’s two key difference (other than slight aesthetic differences) which is the frequency range, with the Zoom TAC offering a considerably higher range, at full fidelity, of 192kHz, where the T2 can only go to 96kHz, and most likely the largest differentiation is there price. The Zoom TAC-2R is almost 2x the price of the Resident Audio T2. Therefore, you have to ask yourself, does the additional money paid really provide enough value to be worth it? If you’re a professional musician playing large gigs/shows, where the P.A’s are high-quality and you want everything to sound perfect, the Zoom TAC 2R is probably for you. Otherwise, the T2 is your option! Now, to further discuss the Zoom TAC-2R! Well, it’s clear that its size makes it suitable for musicians on the road, for both recording and playing live shows. It features 2 combination XLR/TRS inputs, both of which have separate phantom power switches, making it ideal in cases where you only need it on the single channel. Finally, the unit has 2 dual-balanced line outputs which are the left and right feeds, and 1 headphone output. The Zoom TAC-2R also allows you to easily switch between stereo and mono monitoring, which is extremely useful. Overall, as we previously touched on, if you’re looking for a lightweight & compact audio interface, providing combination XLR/TRS inputs, that offers fantastic sound quality (24-bit/192 kHz), then this may be for you! However, if you’re a musician on a budget, but you’re looking for a unit with similar features, take a look at the Resident Audio T2. The Apollo Twin MKII Solo is a 2 input, 6 output audio interface, with Thunderbolt compatibility. The Apollo Twin MKII comes in three variations, Solo (this one), Duo and Quad, with each one referring to the number of DSP power cores that it has, which provides processing power to run software plugins. If you’re looking to use this device just as an audio interface, alongside your DAW plugins and the “free” Universal Audio plugins, then the Solo version is ideal… However, be mindful that as you add more tracks and enable more plugins, the core is being utilized harder. Therefore, for those who are looking to run more plugins within your recording & live sessions, you’re probably going to be better with the Duo or even the Quad unit. The way we see it, is if you’re considering this unit, it’s clear that you’re looking for ultra high-quality sound quality and have the budget to pay for it… Therefore, what’s the additional hundred or so more, when it means that you can upgrade and get the Duo… So that you can access the full potential of the audio interface without being limited by processing power. More about the Solo itself! It features a 24-bit/192kHz audio conversion processor so you can be sure that it provides superior sound quality, but then you’re expecting that for an interface at this price-point. Additionally, the unit has 2 premium Mic/TRS combination preamps, 2 TRS lines out and 2 monitor (L+R) outputs. The unit comes with UAD plug-in bundle, featuring legacy versions of the LA-2A, 1176LN, Pultec EQP-1A, plus Softube Amp Room Essentials, Raw Distortion, 610-B Tube Preamp & EQ, and more. Not only this, but it also has a talkback mic function, for communication with studio talent for recording and live purposes. It even comes with Console 2.0 software, which features channel strip presets, drag and drop functionality and runs UAD powered plugins. Overall, the Universal Audio Apollo Twin MKII Solo is ideal for the user who isn’t inclined to use too many additional UAD plugins, which will obviously require more processing power. None-the-less, it still features the creme-de-la-creme of audio technology within this unit, and so you’re still getting the same wondrous dry sound quality in the Solo, in comparison to the Quad. The Apollo Twin MKII Duo is a 2 input, 6 output audio interface, with Thunderbolt compatibility. The Apollo Twin MKII comes in three variations, Solo, Duo (this one) and Quad, with each one referring to the number of DSP power cores that it has, which provides processing power to run software plugins. More about the Duo itself! Overall, the Universal Audio Apollo Twin MKII Duo is the happy medium of the product line, with it featuring 2 primary DSP cores, meaning that it’s able to handle additional processing in real-time, extremely useful if you’re looking at using this for live performances, live recordings/sessions. Regardless of the version you choose (Solo, Duo and Quad), they all still feature the same “creme-de-la-creme” audio technology, and so you’re still getting the same wondrous dry sound quality in the Duo, in comparison to the Solo & Quad. The Apollo Twin MKII Quad is a 2 input, 6 output audio interface, with Thunderbolt compatibility. The Apollo Twin MKII comes in three variations, Solo, Duo and Quad (this one), with each one referring to the number of DSP power cores that it has, which provides processing power to run software plugins. The way we see it is, if you’re considering this unit, it’s clear that you’re looking for ultra high-quality sound quality and have the budget to pay for it… Therefore, what’s the additional hundred or so more, when it means that you can upgrade and get the Duo… So that you can access the full potential of the audio interface without being limited by processing power. Overall, the Universal Audio Apollo Twin MKII Quad is the most expensive version in the product-line, featuring 4 primary DSP cores, making it extremely flexible and able to handle simultaneous processing with ease. This version is more ideal for someone who’s going to require this kind of additional processing power, such as electronic music producers, or musicians who want to be able to use plenty of UA plugins, over multiple tracks within a session. These additional cores also make it the most suited for live performances and live recordings/sessions as it’s less likely to be affected by latency issues. However, regardless of the version you choose (Solo, Duo and Quad), they all still feature the same “creme-de-la-creme” audio technology, and so you’re still getting the same wondrous dry sound quality in the Duo, in comparison to the Solo & Duo. Read Amazon Customer reviews for the Resident Audio T4. The Resident Audio T4 audio interface is a 4-channel unit, operating at 24-bit/96kHz, with added MIDI I/O. As far as providing value for money, the T4 is up there with it’s younger brother, the T2, being incredibly affordable and providing a high level of audio quality for users. This is all confirmed by the customer feedback and reviews of the unit, which overall indicate that the product works perfectly and generally satisfies the buyer’s needs. In direct comparison to the T2, the T4 has 4 channels, which also means that it’s physically larger in size to accommodate for the additional circuitry. Similarly to the T2, the T4 has XLR/TRS combination inputs, which all have separate phantom power switches, making it ideal in cases where phantom power is only needed on certain inputs. As for the outputs on the unit, it has 4 dual-balanced line outputs and 1 headphone output. Overall, we think that the T4 is a great Thunderbolt-powered audio interface for those who’re looking for a 4-channel unit, and are on a budget. Similarly to its younger brother, the T2, the T4 is bus-powered which means no AC cords or batteries are required for operation, meaning that you can easily integrate it into your live performance or practices, without any fuss. Apogee is a company that needs no introduction in the audio interface industry. They are what we like to call the “Apple of the audio interface” world, developing ultra sleek, high-quality equipment that oozes with finesse and luxurious sonic capabilities. You might tell by now that we’re fans of Apogee, and have used their audio interfaces upon many occasions. As for the Element 24, well, it’s a 10 x 12 Thunderbolt audio interface unit, which is rack-mountable. In direct comparison to other units on the list, this one suits being left in the rackmount cabinet (if you’re playing live shows) or in your studio if you’ve got it as part of your studio setup… What we’re trying to say is that it’s not as portable as other units. Now, how about operating the unit? Well, alongside the Element 24 comes the ‘Element Control’ software, which provides virtual control of important hardware parameters, including input gain, output level and low-latency monitoring. However, what you’re getting from this Apogee unit is a Mac-compatible ultra-low latency interface, and with its 2 analog inputs, accompanied by some mighty mic preamps… It’s clear that this unit is made for someone who’s putting sound quality above everything else. Overall, the Apogee Element 24 is marketed as a premium-quality unit and with knowing the quality of their other units, we can safely assume that this unit provides exceptional sound quality. None-the-less, you’re only getting 2 XLR/TRS combination inputs, which for some may be enough, but for others wont be, but as other reviews have stated, you can easily expand with an ADAT (optical) device, such as the Behringer 8-ch AD/DA Converter, which in turn means that you’re saving a lot of money. As for the Element 46, well, it’s very similar to it’s younger brother, the Apogee Element 24, but instead the Element 46 has 4 XLR/TRS combination inputs as opposed to the Element 24’s 2. It’s a 12 x 14 Thunderbolt audio interface unit, which is rack-mountable. In direct comparison to other units on the list, this one suits being left in the rackmount cabinet (if you’re playing live shows) or in your studio if you’ve got it as part of your studio setup… What we’re trying to say is that it’s not as portable as other units. Now, how about operating the unit? Well, alongside the Element 46 comes the ‘Element Control’ software, which provides virtual control of important hardware parameters, including input gain, output level and low-latency monitoring. Overall, the Apogee Element 46 is marketed as a premium-quality unit and with knowing the quality of their other units, we can safely assume that this unit provides exceptional sound quality. It’s ideal if you’re looking for unit providing 4 XLR/TRS inputs. However, if you’re looking for even more inputs, whether or not it’s better to choose the Element 24 and then expand with an ADAT (optical) device, such as the Behringer 8-ch AD/DA Converter, is certainly an option. Otherwise, if you want to stick with Apogee, why not take a look at their Apogee Element 88, which has even more inputs, we’ve featured it next on the list. It’s a 16 x 16 Thunderbolt audio interface unit, which is rack-mountable. In direct comparison to other units on the list, this one suits being left in the rackmount cabinet (if you’re playing live shows) or in your studio if you’ve got it as part of your studio setup… What we’re trying to say is that it’s not as portable as other units. However, what you’re getting from this Apogee unit is a Mac-compatible ultra-low latency interface, and with its 8 analog inputs, accompanied by some mighty mic preamps… It’s clear that this unit is made for someone who’s putting sound quality above everything else. Overall, the Apogee Element 88 is marketed as a premium-quality unit, capable of handling 8 channels of XLR (4 with TRS functionality) simultaneously, whilst providing exceptional sound quality. It’s ideal if you’re looking for unit providing 8 XLR inputs, suiting professional sound engineers/musicians who are looking for a high-quality recording/live audio solution. As we’ve previously discussed, Apogee charge a substantial amount to allow their customers access to 8 channels, when instead, you could try to keep costs down by purchasing the Element 24 and then expanding its functionality with an ADAT (optical) device, such as the Behringer 8-ch AD/DA Converter. Which provides as many inputs for half of the price. However, we realize that some will still want to choose the Apogee Element 88 despite the price-point, but we’re just here to outline the potential solutions no matter your budget. Focusrite is another company that needs zero introduction within the audio interface industry… Mainly because they’ve been creating industry-leading products at extremely affordable prices for years. Not only this, but the brand doesn’t use its affordability to mask any quality issues. On the contrary, they use only the best circuitry and even include 2-years manufacturers warranty with their products… With that being said, the Clarett audio interface that we’re going to be discussing offers a 24-bit/192kHz audio resolution, so you can expect ultra-high sound quality. The Focusrite Clarett 4Pre is another unit on the list which suits being rack-mounted from the outset; It features 4 XLR/TRS combination inputs and 4 TRS line outputs. Additionally, the unit has MIDI input & output capability, optical input/output, S/PDIF input and output. Where the unit really excels is regarding its 2 specifically-designed microphone preamps, which include a unique analog-sounding “air” effect mode. This mode emulates the sound of Focusrite’s classic transformer-based ISA preamps and thus provides a more vintage, signature sound… And a sound which is behind thousands of hit records. Overall, this is a great audio interface with Thunderbolt connectivity for anyone who’s looking for 4 XLR/TRS inputs/4 Line outputs, additional functionality combined with a 2-year manufacturers warranty and unique preamps offering their custom “air” effect mode. However, if you’re looking for more inputs/outputs, whilst still looking for a Focusrite unit with 2-year manufacturers warranty, take a look at one of the ‘older brothers’ in the series, which we’ve featured below. The Focusrite Clarett is another unit on the list which suits being rack-mounted from the outset; It features 8 XLR/TRS combination inputs and 10 TRS line outputs. Additionally, the unit has MIDI input & output capability, optical input/output, S/PDIF input, and output. Where the unit really excels is regarding its 8 specifically-designed microphone preamps, which include a unique analog-sounding “air” effect mode. This mode emulates the sound of Focusrite’s classic transformer-based ISA preamps and thus provides a more vintage, signature sound… And a sound which is behind thousands of hit records. Overall, this is a great audio interface with Thunderbolt connectivity for anyone who’s looking for 8 XLR/TRS inputs/8 Line outputs, additional functionality combined with a 2-year manufacturers warranty and unique preamps offering their custom “air” effect mode. However, if you’re looking for even more inputs/outputs, whilst still looking for a Focusrite unit with 2-year manufacturers warranty, take a look at one of the ‘older brothers’ in the series, which we’ve featured below. The Presonus Quantum 2 is a 22 x 24 audio interface, and is noted as being the fastest and best-selling audio interface that Presonus have. The unit itself is fairly premium-priced, and for this, you’re getting a Thunderbolt 2 compatible interface (meaning minimal latency), featuring 4 XLR/TRS combination inputs, alongside 4 line outputs and a range of additional features, including MIDI input/output, SPDIF input/output and last of all, the unit’s fantastic XMAS Class A analog preamps. Now, this unit is priced similarly to the Focusrite Clarett 4Pre unit, which features the same amount of combination XLR/TRS ports, but comes with 2-year manufacturers warranty (compared to Presonus’ 1-year warranty) and has some nice sounding preamps which have the ability to emulate the sound of Focusrite’s classic transformer-based ISA preamps when in “air” mode… A vintage mode used in hundreds of hit songs. However, where the Presonus unit stands out is with its connectivity, using Thunderbolt 2, as opposed to the Clarett using the original Thunderbolt connection. The bitrate of Thunderbolt is 10 Gbps in comparison to the Thunderbolt 2’s 20 Gbps… So the Presonus is the clear winner here when it comes to having near to zero latency issues, unless you’re looking at the expensive Universal Audio Apollo series units. Overall, Presonus are incredibly well-known and reputable within the field. This Quantum 2 22 x 24 interface is ideal for a studio who wants high-quality recordings, near to zero latency with it’s Thunderbolt 2 connection, and are open to the ability to expand operations further down the line, with the ability to stack multiple units for more inputs/outputs. The Presonus Quantum 2 is a 26 x 32 audio interface, and is noted as being part of one of PreSonus’s fastest and best-selling audio interface lines that Presonus have. The unit itself is premium-priced, and for this, you’re getting a Thunderbolt 2 compatible interface (meaning minimal latency), featuring 8 XLR/TRS combination inputs, alongside 8 line outputs and a range of additional features, including MIDI input/output, SPDIF input/output and last of all, the unit’s fantastic XMAS Class A analog preamps. Now, this unit is priced similarly to the Focusrite Clarett 8Pre unit, which features the same amount of combination XLR/TRS ports, but comes with 2-year manufacturers warranty(compared to Presonus’ 1-year warranty)and has some nice sounding preamps which have the ability to emulate the sound of Focusrite’s classic transformer-based ISA preamps when in “air” mode… A vintage mode used in hundreds of hit songs. However, where the Presonus unit stands out is with it’s connectivity, using Thunderbolt 2, as opposed to the Clarett using the original Thunderbolt connection. Overall, Presonus are incredibly well-known and reputable within the field. This Quantum 2 22 x 24 interface is ideal for a studio who wants high-quality recordings, near to zero latency with its Thunderbolt 2 connection, and are open to the ability to expand operations further down the line, with the ability to stack multiple units for more inputs/outputs. The Presonus Quantum 2 is a 48 x 48 ‘All Line Input’ audio interface, and is noted as being part of one of PreSonus’s fastest and best-selling audio interface lines that Presonus have. The unit itself is premium-priced, and for this, you’re getting a Thunderbolt 2 compatible interface (meaning minimal latency), featuring 32 channels of analog balanced line inputs/outputs via DB25. As we’ve previously talked about, it’s clear that the Presonus units stand out when it comes to discussing the Thunderbolt connectivity, as it uses Thunderbolt 2. Overall, Presonus are incredibly well-known and reputable within the field. This Quantum 2 48 x 48 interface is ideal for a studio looking for an ‘all line input’ audio interface, which offers high-quality recordings, near to zero latency with its Thunderbolt 2 connection, and are open to the ability to expand operations further down the line, with the ability to stack multiple units for more inputs/outputs. The Universal Audio Apollo x6 16 x 22 is a Thunderbolt 3 (but compatible with Thunderbolt 1 & 2 Macs – with a special adapter) audio interface, which coupled alongside it’s 6-core Hexa Core processors, means that it offers incredibly low (less than 2ms) latency and provides 50% more processing power than the previous Universal Audio Apollo units. The unit’s Unison Preamp technology allows for users to recreate sounds of the classic LA-610 preamp, without it sounding like an emulation, but more like a near exact-match sound processing. This provides studios with a range of stylistic options when it comes to achieving the right sound for their project. One potential disadvantage of this unit is the fact that it only features 2 XLR/TRS inputs (located at the rear). None-the-less, it has an ADAT optical input/output, so you have the ability to expand this capacity if this doesn’t suit your needs… Or purchase a device that provides more XLR inputs. Overall, Universal Audio have definitely upgraded the technology in this interface when comparing it to previous Apollo units. For us however, we prefer a unit with more XLR inputs, but this may be ideal for some! Despite this unit not having an SPDIF input/output, it does feature 8 XLR/TRS combination inputs which is fantastic for those looking to plug multiple hardware in simultaneously. Additionally, the unit has 2 ADAT S/MUX inputs & outputs. Overall, Universal Audio have definitely upgraded the technology in this interface when comparing it to previous Apollo units. And because it has more analog inputs than the x6 unit, we do like it! We imagine that commercial music studios will be interested in an interface such as the Universal Audio Apollo X8P 16 x 22, for its high audio quality (being able to also support 7.1 surround formats), low-latency, HEXA Core processing chips and versatility. MOTU is an extremely well-known and reputable US audio interface and recording equipment manufacturer and one in which we have to feature in our list. The unit provides users with two mic preamps, 8 analog line inputs, 8 analog line outputs, 2 XLR outputs and a pair of stereo headphone outputs. Not only this, but it comes with 16 channels of ADAT, stereo S/PDIF, MIDI, and word clock input/output. Overall, considering the price-point of similarly functioned audio interfaces, the MOTU 828es provides great value for money, and would be a fantastic unit for most studio setups. 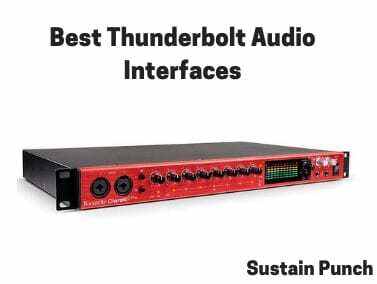 Since we realize that each reader will have different requirements from an audio interface, we’ve provided a variety of Thunderbolt-compatible audio interfaces for you to choose from, with a clear indication of their prices and technical specifications. Resident Audio T4 Thunderbolt Interface – $ – For those who still want a more inexpensive unit, with all of the features of the T2, just with 4 XLR/TRS inputs & 4 outputs instead. Presonus Quantum 2 22×24 interface – $$$ – XMAX Class A microphone preamps, 4 XLR/TSR inputs, Thunderbolt 2 connectivity, suitable for both Mac and PC, and includes a 1-year manufacturers warranty… All for a reasonable price too! MOTU 828es 28×32 Interface Thunderbolt 3, 2 & 1 – $$$ – 8 TRS line inputs, 2 XLR inputs, MIDI, S/PDIF & Optical I/O… This unit comes with a lot, and not only that, it’s compatible with Thunderbolt 1, 2 & 3. It also comes with a 1-years manufacturers warranty for reassurance.